A 5.000 year old grave monument with its entrance point to the east. The entrance of the grave chamber from the east. In the Dolmen at Haväng an important person was buried during the neolithic period, i.e. about 5.000 years ago. Therefore the geographical and astronomical placing of the Dolmen at Haväng, must have been of great importance. 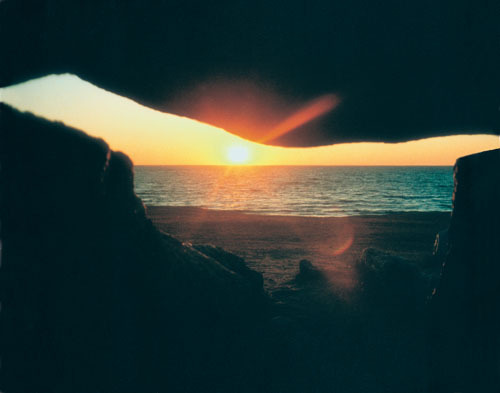 The entrance to this stone chamber grave is oriented in such a way that the sun rising from the seahorizon at the time of the vernal and autumnal equinoxes shines into the chamber from 06.00 to 06.20. This shows that the people who built the Haväng Dolmen had an extremely precise knowledge of calendar time. During an excavation of this burial chamber in 1869 only a few human skeleton parts and a flint axe were found - indicating that the grave had already been visited by grave robbers. 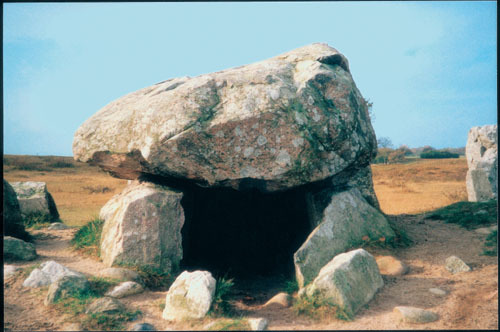 Some data: The burial chamber is 1,65 x 0,60 m. The roof block is 2,7 x 2,0 m. The height of the dolmen is 1,25 m. The 16 surrounding stones are 0,6 m to 1,20 m high. 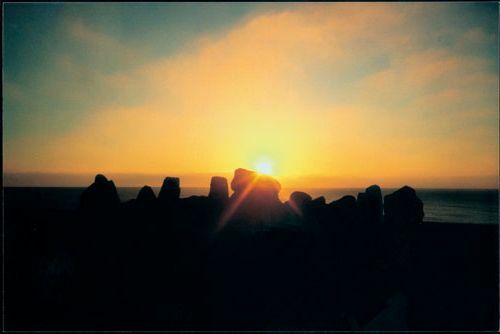 The area is 12 x 5,5 meters..
Sunrise in the east at the vernal- and autumnal equinox. Ref, Ales stenar ur ett arkeoastronomiskt perspektiv. The book can be ordered by e-mail: boblind50@gmail.com or by phone: +46 40 54 52 94, Stjärnljusets förlag V.Rönneholmsvägen 76d, 217 41 Malmö, Sweden.